Moon Jigs – Moon Jigs come in a pack of (2) two. 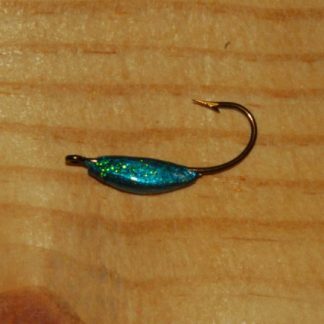 They are hand made in the U.S.A with Mustad Hooks and come in a wide variety of colors. Our Moon Jig Lures are shaped like a half moon. All of our jigs can be used all year long by many of the fisherman. Moon Jigs also knew as Ice fishing Jigs, Ice Jigs, Moon Jig Lures and Glow Body Jigs. They are multi-use jigs but commonly used for spider rigging with live bait or ice fishing (Tipped with a Minnow, waxworms, mousie, wigglers, spikes or anything else you want to try ) for Multi-specie including Black and White Crappie, Papermouths, Strawberry Bass, Specks, Speckled Perch, Calico Bass, panfish, Steelhead, Trout, Jumbo Perch and more.